The Piranha ES (Extended Sensitivity) family brings an incredible combination of speed, resolution and sensitivity to low-light applications, bridging the sensitivity gap between single line cameras and the highest sensitivity Piranha HS series. With up to 32 or 64 TDI stages and up to 12k resolution, the Piranha ES cameras open new possibilities for high-performance cost sensitive inspection. The new TDI family makes it easy and cost effective to switch from line scan to TDI. 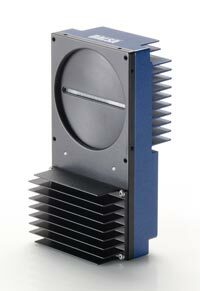 The Piranha ES cameras provide an alternative to traditional line scan imaging. They enable you to meet the line rates and responsivity necessary for your high performance applications and allow you to reduce the number of cameras in your system. When you use fewer cameras, you use fewer frame grabbers, lenses, computers and cables. The Piranha ES family delivers the lowest price/pixel TDI system solution ever offered by Teledyne DALSA. Lighting costs can also be reduced. With TDI imaging, you can use LED lights, helping you to optimize system up-time and productivity. Teledyne DALSA’s high sensitivity line scan products use TDI (time delay and integration) technology. TDI is a method of line scanning which provides dramatically increased responsivity compared to other video scanning methods. It permits much greater scanning speeds in low light, or allows reduced lighting levels (and costs) at conventional speeds. From wafer, PCB, and LCD panel inspection to high-end document scanning, Teledyne DALSA’s advanced, high sensitivity line scan delivers an unmatched mix of sensitivity and speed. TDI is based on the concept of accumulating multiple exposures of the same (moving) object, effectively increasing the integration time available to collect incident light. The object motion must be synchronized with the exposures to ensure a crisp image. More speed. With more effective integration time, you can increase the speed of the target object or inspection web. Less light, less expense. Instead of high-powered, high-cost, high-temperature halogen lighting with DC power, you can use high-frequency AC or even LED lighting, profoundly lowering your system maintenance costs. TDI operation effectively averages out fluctuations in light intensity to represent a DC light source. This factor alone can justify the increased cost of a TDI sensor versus the cost of using DC regulated light source and a line scan image sensor. TDI requires more care in synchronization and alignment. But in general practice these requirements are not difficult to achieve. A TDI sensor canwithstand some misalignment (either translational or rotational) without negative effect on image quality. A total misalignment of one pixel or less across the length of a TDI sensor will not affect image quality. In most applications, a 96-stage TDI device can comfortably tolerate a 2-4% velocity mismatch between inspection web and imager. This is not difficult to achieve using a web-mounted encoder to supply a sync signal to the camera, even with webs that change speed. This approach is used in thousands of successful applications. Designed for light-starved applications, TDI generally lacks antiblooming to contain “glints.” But Teledyne DALSA offered the world’s first antiblooming TDI devices. We are the acknowledged world leader in this area. TDI sensors generally use photogates–surface electrodes covering the entire pixel. While this ensures 100% fill factor, it can attenuate incoming photons in the deep blue region. Teledyne DALSA has developed enhanced blue response TDI sensors to compensate. The Piranha ES provides you with the flexibility to choose how you want to image. The area mode of operation facilitates camera set-up by allowing you to focus on a larger imaging area. You can also use area mode as your regular mode of operation. Other programmable features include number of taps, bit depth, flat field correction, direction control, stage selectability, and gain and offset control.